Why is Honda’s lovable child-sized android Asimo so damn adorable despite having a darkened, astronaut-mask-like visage? This and other important questions answered right here, right now in TWIB. We’ve seen kitchen bots before, performing robotic cooking tasks with differing degrees of success…and messiness. In particular, Munich’s Technical University has demonstrated its two robots, James and Rosie (a PR2 and a custom machine from DLR), can make sausages and pancakes. Now the team busy programming them has taken them to new culinary heights: They can now prepare popcorn and sandwiches. Before you dismiss this as a meaningless stunt–something generations of robots before could’ve done if programmed properly and if ingredients were carefully placed–then you should know that James and Rosie aren’t specifically programmed with a “left, right, break egg, stir” type command set. They’re taught the ingredients for the dishes, and the order that things work in, and whether they need heating and so on. The robots then make all the decisions about adding items, mixing, turning on the stove and so on. Essentially they’re acting as very dim sous-chefs, and this hints at an exciting future of robotic home assistants that may be useful far ahead of when we’d been assuming. MIT’s Personal Robotics Group has been responsible for some great robotics innovations, and now a new creature is getting some limelight: DragonBot. Designed to look like a pseudo-dragon toy, perhaps with a hint of Mogwai thrown in, the toy-like device has an expressive face that’s powered by an Android phone. That phone is actually the robot’s brain and also its access through the web to all the other DragonBots. This is actually the robot’s big secret, a “cloud robotics” aspect that shares some of the artificial intelligence of each unit with all the others–so if one is taught a new trick, all the others will learn it too. Smart, and a powerful tool to go alongside DragonBot’s main purpose as a robot educational system–it’ll also result in insight into how social interactions between humans and robots can be effectively shared. Cute though DragonBot is, and fairly low-priced too, thanks to the Android element, he’s still a hefty $1,000 to buy. In New Zealand a retirement village is playing host to what’s said to be the first of this sort of experiment ever: A large-scale integration of care and helper robots into the human population. Thirty-one robots in all are taking part, which equates to roughly one for every three residents. The project is dubbed Healthbits, and this is the cumination of work begun in 2008 with research and small-scale experiments. The robots are installed in various places in the village, including the cafe, and as well as providing basic medical care like measuring blood pressure or heart rates, and reminding residents to take medication, they’re also designed for more caring roles–including providing entertainment like playing videos and games, to boost mental smarts, and acting as Skype portals and companions (because there are a few Paro bots in the mix, which have been found useful in Japanese retirement homes). India’s Defence department and its Defence Research and Development Organization have perhaps been watching the development of the Boston Dynamics BigDog, AlphaDog, and Petman projects with close attention. The DRDO has just set up a new research facility with a very tightly defined goal: To bring robots to the battlefield alongside Indian soldiers, to act as both warrior devices and cargo transporters. The idea is to design and build the robots nationally, and have them in service by 2020 to 2030–doing “whatever a soldier will do in warfare” according to the DRDO’s director general. Part of the challenge in developing new robots, and learning about robot technology and programming in an educational environment, is actually getting hold of the things–they tend to be boutique, expensive machines. That’s something a new device called Brainlink is designed to combat. Think of it as a bolt-on turbo-booster for existing simple robotic (or even just electronic) machinery. It relies on hijacking a robot’s infrared controls (making it ideal as a mod to Roomba-style vaccum cleaners) and then links to an Android phone. By programming in Java, highly sophisticated responses and interactions can be achieved that the original bot couldn’t have managed. Unlike other educational robotic tools, Brainlink is just $125. One challenge thrown up when a robotic future is promised is “they’ll just steal human jobs!” That, according to a new study from the International Federation of Robotics, is simply not true–at least as far as the manufacturing industry is concerned. Installing robots boosts output and efficiency (they don’t need sick days or cigarrette breaks) and is useful for churning out products that wouldn’t be sensible to produce where workers typically earn high wages, as well as products that humans simply couldn’t compete with–due to precision or safety issues. The IFR’s study suggests that in recent years 3 million jobs have been created by robotics, and another one million are likely inside the next five years. An experiment at Boston Children’s Hospital is seeing some discharged patients taking a sophisticated telepresence robot home with them for a while. The idea is that care doesn’t just stop when you leave the protected environs of the hospital, and post-operative situations can be boosted by having a doctor or nurse check in with the patient regularly, giving them advice and checking on their progress. The robots are the Vgo telepresence droids, more commonly destined for remote-working environments in offices, and while the pilot program is really about taking a medical professional “home” with you, the ultimate goal is to have the droids actually help–perhaps by performing simple medical tests like analyzing urine, with the results being automatically being beamed back to the medical carers. 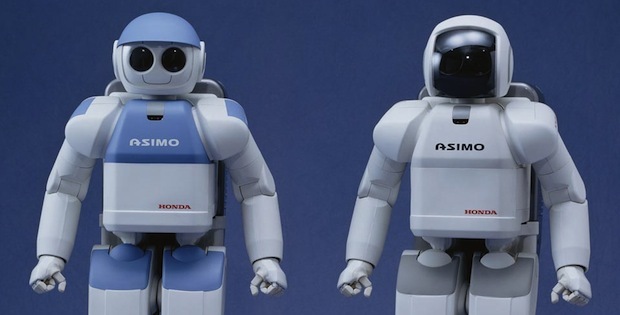 Why Doesn’t Asimo Have a Face? Honda’s lovable child-sized android Asimo is definitely adorable–despite the darkened visage. Now, thanks to insights into the project from a new book, we learn that this was a very deliberate design decision, based on trailing different designs of a robot face for the famous machine (varying from abstract to realistic) and seeing how human focus groups reacted. The answer, for the abstract to hyper-real faces, was generally negative, and some children reported nightmares after the tests. Though this may seem amazing, particulalry for a culture like Japan that one may imagine is steeped in robot tech, it taps into one very important part of how we’ll welcome robots into our lives: We have to relate to them in some meaningful way. Asimo’s blank astronaut-like mask, a stark contrast to other designs like the Geminoids, was chosen to give him a particular look that users felt they could trust–an important quality for a robot that may one day be helping Granny up the stairs into bed, or pouring one’s morning coffee.